Ephemeris for April Fools Day, Monday, April 1st. Today the Sun will be up for 12 hours and 46 minutes, setting at 8:10, and it will rise tomorrow at 7:22. The Moon, half way from last quarter to new, will rise at 6:37 tomorrow morning. Last year we were fooled by an abundance of snow in April. Hopefully we won’t be tricked again. Daylight hours in the Interlochen/Traverse City area and will increase from 12 hours and 46 minutes today to 14 hours 11 minutes on the 30th. The altitude, or angle, of the Sun above the southern horizon at local noon will ascend from 50 degrees today to 60 degrees on the 30th. The altitude of the Sun in the Straits area will be a degree lower, but their daylight hours will be a bit longer. The actual time of local apparent noon this month for the Interlochen/Traverse City area, when the Sun passes due south, will be about 1:43 p.m. This month Mars will be our only evening planet. Star Chart for April 2019 (10 p.m. EDT April 15, 2019). Created using my LookingUp program. Click on image to enlarge. 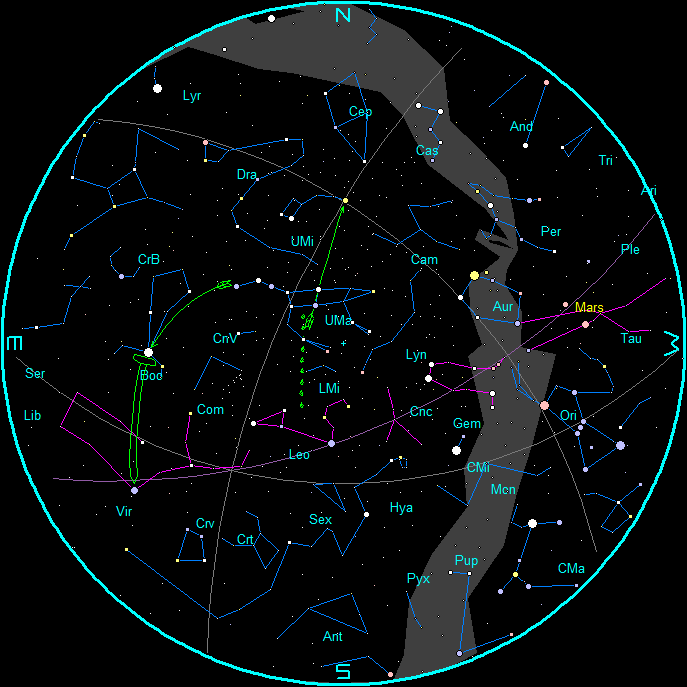 The planets and stars are plotted for the 15th at 10 p.m. EST in the evening and 6 a.m. for the morning chart. These are the chart times. Note that Traverse City is located approximately 45 minutes behind our time meridian, West 75° longitude. (An hour 45 minutes behind our daylight saving time meridian during EDT). To duplicate the star positions on a planisphere you may have to set it to 1 hour 45 minutes earlier than the current time. Note the chart times of 10 p.m. and 5 a.m. are for the 15th. For each week before the 15th add ½ hour (28 minutes if you’re picky). For each week after the 15th subtract ½ hour. The planet positions are updated each Wednesday on this blog. For planet positions on dates other than the 15th, check the Wednesday planet posts on this blog. 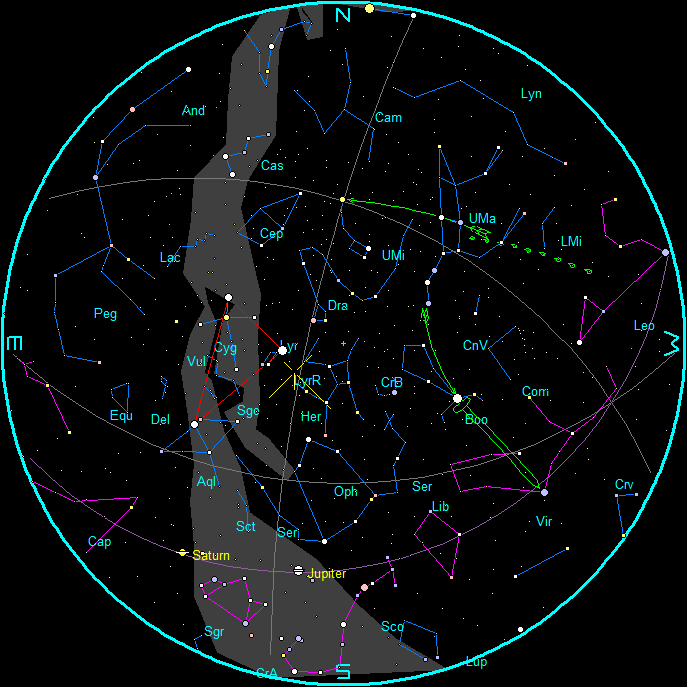 Star Chart for April mornings 2019 (5 a.m. EST April 15, 2019). Created using my LookingUp program. Click on image to enlarge. LyrR is the radiant of the Lyrid meteor shower that peaks on the 22nd. Date Astro. Nautical Nautical Astro. Start End Illum. See my blog post: Twilight Zone for the definitions of the different periods of twilight here: https://bobmoler.wordpress.com/2018/09/27/. All event times are given for UTC-5 hr: Eastern Standard or UTC-4 hr: Daylight Saving Time starting April 10th. If you go to the above site you can print out a list like the above for the entire year or calendar pages for your time zone.